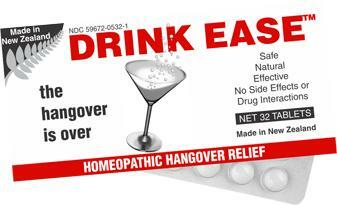 Drink Ease is an effective remedy to help counter the unpleasant after-effects of alcohol consumption. Employing a combination of safe homeopathic ingredients, it helps the body combat the symptoms generally known as "hangover", including headache, indigestion, nausea and dizziness. Hangover is not due solely to the amount of alcohol consumed. Other factors such as the type and quality of the alcoholic beverage are significant. It is also important to take food with alcohol, and the after-effects can be greatly ameliorated by drinking water both during and after alcohol consumption. Drink Ease does not directly neutralize the chemical effects of alcohol, but stimulates the body's own natural processes to deal more quickly and efficiently with its poisoning effects. Drink Ease has no harmful side-effects. After the MTV awards "We were out till 4:30am. In the morning I was completely fine, I didn't have a hangover"
"Its too good to be true, but it worked for our sports guy Money"
"Drink Ease, tell you what man, they helped me out." Drink Ease was selected by the 10th Annual Screen Actors Guild Awards to be given to all the celebrity Presenters and Nominees in their gift baskets.